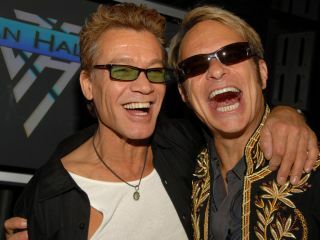 Years of speculation were ended last night when Van Halen took to the stage in New York to play a 45 minute set and later confirmed the release of their new album 'A Different Kind Of Truth', due 7 February. Last year, if you had told TG we'd see 'Sabbath back together, The Beach Boys reuniting with Brian Wilson and Van Halen play live with David Lee Roth, all within a three month period, we would have looked you straight in your mad eyes and laughed at your crazy ways. It happened though, and US journalists (including several TG contributors) were among the privileged few invited to witness Van Halen's live return at New York's Cafe Wha? last night (5 January). The band (consisting of Eddie Van Halen, David Lee Roth, Alex Van Halen and Wolfgang Van Halen) played a 45 minute set, running through a list of hits drawn primarily from their first two albums, including 'Panama', 'Jump' and 'You Really Got Me'. In addition, the group confirmed that 'Tattoo' - the first single from the new full-length, and their first with Roth since he left the band in 1985 - would be unveiled this coming Monday (10 January). A massive US tour is set to follow the release of the new album, winding up in late June, which would be just in time for them to pop over to the UK for a festival set thank you please.